We Have Prosecco on the Piazza (in Florence) | Sprezzatura, Y'all! The clock is ticking on us. We’re counting down the days we have left and have decided to make the most of them. We have no regrets about what we’ve done, but now that the end is in sight, we want to make every moment count. Today was a beautiful Sunday, cold, but bright and clear, and we decided to take the train from Arezzo to Florence for the day. Arezzo is about 30 minutes away by car, or you can take a bus from Anghiari to Arezzo in about the same amount of time. We drove. You can park at the train station, buy your train ticket and you’re off. The train from Arezzo to Florence is about an hour, so from our apartment to Florence is about an hour and a half. It’s a great trip and the train station in Florence is right in the historic area, just a few blocks from the duomo. So easy. Florence is always crowded, but in the middle of winter it is actually quite pleasant. In the spring, summer and fall, it’s overrun with tourists. But in late January, it’s nice. Enough people to remind you that you’re in one of the premier cities of the world, but not so crowded that you can’t enjoy it. There’s a lot to recommend visiting Italy in the winter. The weather here is not that bad in the winter. Most days are bright and clear, but very cool. It’s kind of fun to walk around all bundled up and stop in little cafes along the way to warm up. Today was a pretty typical day and it was in the low 40’s. Very nice to stroll around. We didn’t go to any museums or galleries. Didn’t go in the Duomo or the Baptistery. We just walked. We stopped and looked at beautiful things and watched the people, but mainly we just strolled through Florence. We had lunch at one of my Slow Foods restaurants (they’re always good!) near Santa Croce, Cibero. It was very good. It was one of those places that you can actually have two or three courses and not feel overstuffed. The portions were very reasonable. I like that, because I like to sample as much as I can everywhere I eat. Cibero has a caffe, a restaurant, and a trattoria – all adjacent to each other. We went to the trattoria. There were about 10 tables in there and we got in just in the nick of time. It filled up fast and they were turning people away left and right. I love going to these kind of places for Sunday lunch. Most of the tables were filled with families having their Sunday meal together. A long, slow meal. A lot of the tables were filled when we got there and still filled when we left. And we had a nice long meal. Italians really take their time eating. They do not rush – they savor the food and the company. They’re loud and they’re happy and they have a good time. We were happy and had a good time, but we weren’t loud. We had a fabulous meal – I had ribolitta and pork roast. Steve had spinach sformata and chicken and ricotta meatballs. After lunch, we went to the caffe just around the corner for dessert. Chocolate cake – wonderful. The restaurant was near Santa Croce church, which is one of our favorite places in Florence. In front of Santa Croce is a wonderful piazza. It’s one of the greatest piazzas in the country, in my opinion, and I just love being there. It’s big and there are gorgeous buildings encircling it and it’s the perfect place to people watch or take in the scenery. After our meal, we walked to the Piazza Signoria and had a glass of prosecco. All the outdoor cafes were open in Florence – if they didn’t have heaters, they had blankets available on each chair. I love that they don’t pull everything inside in the winter, but figure out a way to make it comfortable. The Piazza Signoria is a vibrant place – the Palazzo Vecchio is one side, the Uffizi museum, one of the best museums in the world, is just on the other side of that. It’s where the David was originally installed (but moved inside after someone tried to chop off his toe), and is altogether a fine place to sit and people watch. After our prosecco, we strolled back toward the train station to catch the 5:15 train back to Arezzo. We could have stayed longer, but there was something very wonderful about just being there for the afternoon. Florence is an incredible place and I love that we’re so close to it. I do wish we had visited Florence more often so that we could have come to know the city better, but at this point we’ve both agreed to have no regrets. When we come back, we’ll definitely do it more often. But for now, we just relish being able to spend an easy afternoon in Florence, the birthplace of the Renaissance. 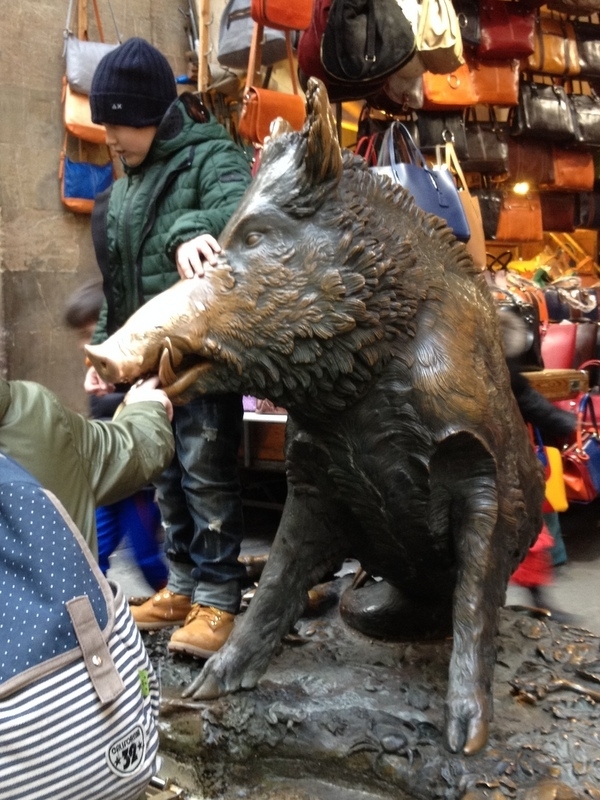 In the Central Market – rubbing the boar’s nose for good luck. I have enjoyed your trip from afar. Thanks, Cary. Your time may be coming soon! Thanks, Susan. It’s hard to have a bad time in Florence!